M. A. Boudet, camp educational adviser, is recovering from a major operation for appendicitis and hernia, according to his physician, W. L Martin. He is in the Sebring General Hospital where he was taken Saturday evening, Novcmber 7. for the operation after he had undorgone observation by Dr. Martin that afternoon. - November 19, 1933, and was honorably discharged on December 28, 1934. On October 23, 193 5, @ereenrolled in this company and was transferred to 1421 at Miami on May 30th of this year. The first national park established by congress was Yellowstone, in 1872.
moved, and road building will be some of the projects that will be put through if the camp is set up during the next period. Hiamod F riday. Major 'tteton was exceedingly pleased with t h e work that theCC is don and referring to the0 ursery, he MAtd, -'It certainly s a nice plAce. Mr.. Simpson said that Mr. Harris appreciated the cooperation that had lbeoi given hit by officials in Charge -of the-park and t,6 CCO members. During the past few weeks the Florida Botanicall Garden has been the recipient of a number of rare and interesting plants. Due to thecontinued and growing interest of the Garden's many friends. Mrs. Ola, Head of Avon Park gave three fine specimens of the leaning Vate palm, which have been planted out in the Palm Garden. They supplement some that previously were presented by Mrs. Swearington of the same city. Iuiling at camp. He was Uderm Ln care of the doctor for several days, but managed to attend to his official duties. Feeling consIderably Improved Mr. Boudet, supervised the construction of the eductional buildIng Saturday morning, afterward going to his home where he suddenly became ill. He wvutaken to the hospital where Dr. ?rtin made a thorough examination seveml times during the afternoon and performea the operation that evening around 1:30 o'clock. Members of the company h a v e been greatly concerned over the condition of the Educati nal AdvisO, making frequent inqWries as to his condition. Due- to the nature of the operation and the condition of Mr. Boudet it has been impossible for anyone to see him. Pleased because the enrollees have been asking about his condition, M. Boudet said he hoped it wouldn't be long before he is back with the "gang." During the absence of the Educational Adviser, the educational program is being supervised by Roy E. Barnes, assistant C. E. A. The beauties of Highlands Hammock were taken in by many of the transfers and new recruits for the first time Sunday afternoon when they were conducted on a trip through the hammock by the Assistant Educational Adviser. The boys were impressed greatly by the way in which the famous aged oaks have been preserved for generations to come. Several pictures were taken on the vesper field. Private individuals are not allowed to acquire land in the Panama Canal zone. work after hours and Saturdays. Construction on the buildings is nearing completion, roads and walks are rapidly going in, the area of the campsite has been cleared and plans are now being worked up for a concentrated' beautification program. In order that these hours of labor and' excellent work will not have been done in vain, let us resolve to protect the accomplishment by cooperating with each other in refraining from practices or habits that will mar the appearance of the camp. Pride in the camp will result in praise from the public. It's a long jump from Pensacola to Key West, but you will never really know your state or appreciate its glory and granduer until you journey from its western gateway to its southernmost tip within a tenday period. One would imagine that having created such a realm of enchantment as Florida's mainland, Mama Nature would have been content to sit back and call it a day, but apparently, intent on making this her unrivaled masterpiece, she couldn't quit until she-had .-adorned her glamorous creation with a string of glorious pearls and a jewel pendant. So she ran a chain of keys and islands along both coasts and far to the south, where the emerald and turquois waters of the Gulf and Atlantic met, who hung the jeweled pendant that we know as Key West. By boat, by highway or by air, the journey from Miami to Key West is a thrilling and delightful adventure. You can have your Mediterranean, Hawaii or the Beach of Bali Bali, but when it comes to charm, tropical beauty and interest, Key West and the over seas highway are good enough for me. but in spite of set-back and tough break after tough break, her people have not lost heart or faith or courage and to-day she. .-is making'r a: comeback that is remarkable. Isolated ina sense from the rest of the state, Key West has'always found transportation a problem. Nature while--favoring this section in many ways, strikes cruelly now and then, lest the self-satisfied populace assumes that they are possessed of an eternal heaven. Few localities in the world have more to effer the tourist and winter visitors and its greatest need today is intelligent publicity and promotion that will acquaint the nation with what it has to offer. Surrounded by the finest fishing waters in the world, Key West is a veritable angler's paradise. Almost every variety of game fish is found here and competent guides are prepared to show the sportsman a time he will never forget. MIAMI BEACH (FNS) Jack Dempsey heavy-weight champion, with several New York associates, announced this week the lease of the seven story Vanderbilt Hotel, which be operated under the management of Mr. Dempsey as the Dempsey-Vanderbilt. tions, had planned to attend the annual meeting of the Press Association, held at Pensacola, Florida, last Friday and Saturday, but due to the illness of M. A. Boudet, educational adviser, it was impossible for him to go. PENSACOLA, Fla. (FNS)-Robert F. Siker, publisher of the Okaloosa News Journal and- representative from his county in the next legislature, was chosen by Florida news, papermen to head their organization for the coming year as president, succeeding George L. Burr, Jr., of Winter Haven. The election of officers closed a two-day session attended by approximately 100 publishers. Speakers on the annual banquet program were John Temple Graves, II, of Birmingham, Hon. C. 0. Andiews, U. S. Senator-elect; Millard V. Caldwell, congressman, and president-elect of the Florida State Senate D. Stuart Gillis. Hollywood Beach was selected for the spring meeting and Tallahassee for the fall session with dates to be set bAhe, incoming president. One of Georgia's rarest botanical specimens is a big sequoyah, or redwood, from California, which is growing in the city cemetery at Milledgeville. the Indian Key Massacre by Dr. Perrine's daughter, one of the survivors who escaped. Careless smokers caused 47,845 fires in the nation In 1935-23 per cent of all forest fires. him many Interesting plants. among them, Hollyhocks, Rose of Sharon, Hardy Sweet Peas and others. Mr. A,C. Altvater has given the park several large clumps of the giant bamboo, which are now being set out along the protection ditch. While on a recent trip to Key West and the lower Florida Keys, Mrs. J. B. McFarlin obtained livIng plants, among them a large columnar cacti, the pelican flower, a vine which bears large flowers often twenty inches across with tails reaching three feet. This plant Is related to the Dutchman's Pipe vine, commonly grown In the North. The vine is a native of the West Indies and South America. Miss Violet Knickerbocker g a v e two fine specimens of the Chinese Arborvitae which have been added to the general coniferous planting. A large collection of seedling pants were received yesterday morning from the nursery of the fashionable Harder Hall hotel. Aftcr the plants are separated a n d classified they will be placed in the nursery for a short period of time and then moved to their permanent home out in the field. Gratefull acknowledgment is given by the officials to all who have contributed to the Garden, for their gifts, encouragement and support of the Florida Botanical Garden. care of accidents has to be paid for by public and community funds, stated, the safety director. 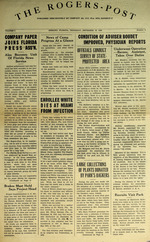 MIAMI (FNS)-The Florida Historical Society, in session at the University of Miami, resolved to enter its second year of aggressive effort to prove to citizens of the state the value of publicizing Florida four hundred years of colorful history. often used indiscriminately, even by writers of recognized standing. There is, however, a distinction. "Farther" denotes a greater distance between two points, as "Seranton is farther from New York than Philadelphia is." "Further" is properly used in the sense of "more in advance" or "additional," aja "A further difficulty is certain to be encountered." In verbs with the prefix "re-" the prefix itelf signifies "gain," "back," "anew." To say, therefore, "He returned back to his originAl starting Ia." is what grammhiians cal a pleonasm-the use of more than the necessary number of words. The sentence should read sitiplyH "e r et me to his original. starting place."